The Cosby Experience in Great Smoky Mountains National Park is perfect for those who are looking for somewhere a bit off the beaten path and away from the big crowds in the park. Nestled on the northeastern side of the Smoky Mountains, Cosby is a great destination for hikers, cyclists, campers, horse lovers, and the locals! This is a terrific one-mile long nature trail beginning at the Cosby Campground near the outdoor amphitheater. A great little walk through a bit of old-growth forest, which Cosby Creek runs through, is magical any time of the year. Hike to Hen Wallow Falls on Gabes Mountain Trail which begins across the road from the Picnic Area just before the entrance to Cosby Campground. One of the main highlights of this trail is the big trees of the old-growth forest. A spur trail steeply descends to the right at mile 2.1 to lead to the base of the waterfall. Use extra caution when stepping on the slippery rocks. This strenuous hike begins on Low Gap Trail located near the designated parking lot for hikers near the Cosby Campground Picnic Area. Low Gap Trail, which is horse-friendly, climbs steeply for 3 miles before intersecting with the famous Appalachian Trail (AT). Take a left on the AT towards the Mt. Cammerer Trail. At almost the 5-mile mark, you’ll find the spur trail that leads the summit of the 4,928 ft. tall mountain. From here, it’s about seven-tenths of a mile to the historic fire tower with views of the beautiful Pigeon River Gorge. The hike to Sutton Ridge Overlook begins on Low Gap Trail for about four-tenths of mile to intersect with horse-friendly Lower Mt. Cammerer Trail. At about mile 1.4 mile you’ve reached the overlook. Lower Mt. Cammerer Trail continues on to access backcountry campsite #35 and then on to intersect with the Appalachian Trail. The graveyard is accessed via Snake Den Ridge Trail that begins near Campsite B-55 at Cosby Campground. The trail begins as an old road and after three little creek crossings you’ll see the small graveyard on your right. Costner (1894-1982) was born in Cosby and grew up on Crying Creek near the Gabes Mountain Trailhead. After her stint as an Army nurse in Pearl Harbor and Guam, she returned to Newport, Tennessee and published several books of poems and essays. For more information on Ella V. Costner, check out her Facebook page! The view from the historic Mt. Cammerer fire lookout has a spectacular Cosby vista! Great Smoky Mountains National Park Celebrates Cosby: Yesterday, Today and Tomorrow! National Park officials announced the “Celebrating Cosby: Yesterday, Today and Tomorrow” community programs to be held every Friday through August 17, 2018 from 7:00 p.m. to 8:30 p.m. at the Cosby Campground Amphitheater. “We appreciate this opportunity to work so closely with the Cocke County Partnership and the Cosby community in offering such a great lineup of programs this summer,” said Superintendent Cassius Cash. “Celebrating Cosby” honors the rich cultural and natural history of the Cosby area. The public is invited to join park staff and community members in celebrating Cosby via informative and fun programs while discovering new opportunities to enjoy this section of the park. Programs vary weekly and include mountain music, moonshiners, story telling, sunset and lantern hikes, farming, orchards, clogging, cooking, and more. Programs will feature artists like local banjo player, David McClary, who plays claw-hammered style banjo music. Friday, June 29, 2018 Mark Ramsey, Digger Manes and Friends will share stories about moonshining. The July and August schedules will be available at the Sugarlands Visitor Center. In the event of rain, “Celebrating Cosby” programs will move to the covered picnic pavilion adjacent to Cosby Campground. Programs will be held rain or shine. Visitors are welcome to find seating in the amphitheater or bring their own chairs or blankets. Contact Park Ranger Katie Corrigan at 865-436-1257 for more information. Cataloochee is a tucked-away destination and its special beauty offers an appeal to all interests and ages. 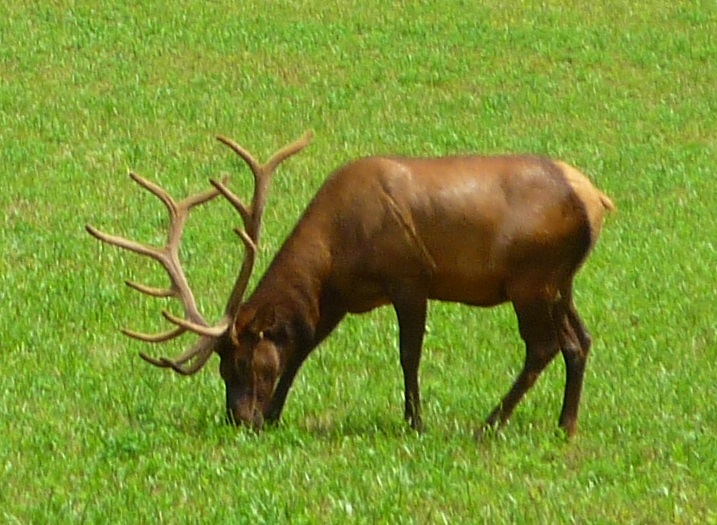 Bring blankets or folding chairs and a picnic, and set up camp for a long afternoon along the large meadow of Cataloochee Valley to watch for the appearance of the elk herd. Lace up those hiking boots and venture down some of the interesting trails located within the park boundaries. Campers will be awed after sundown by the multitude of stars that are visible in the low light of this remote valley. Anglers are sure to enjoy searching out the perfect spot along a rushing creek to land an elusive trout. The equestrian set will appreciate the horse camp and the many trails available. 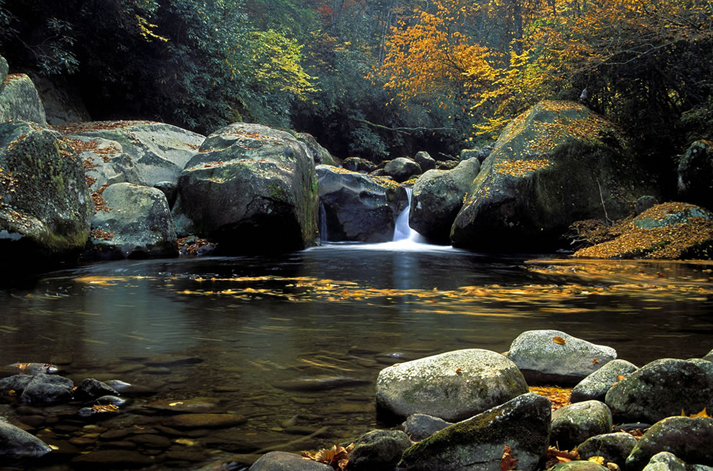 Fishing: Cataloochee Creek and all its tributaries feature an abundant wild trout population. A Tennessee or North Carolina fishing license is required within park boundaries and may be acquired at nearby communities or online from North Carolina at ncwildlife.org or in Tennessee at tn.wildlifelicense.com. Camping: a 27-site primitive campground is located in the valley and is open mid-March through October for tents or RVs up to 31 feet. Group camping is available through advanced reservations. Back country camping requires a permit. For more info, go to recreation.gov. Horse Camp: reservations are required and maybe obtained by calling 877-444-677 or logging onto recreation.gov. Hiking: One of the more popular trails in Cataloochee is the seven-mile loop Boogerman Trail that winds through towering old-growth forests. The Little Cataloochee Trail meanders down an old road that leads past several historical structures. 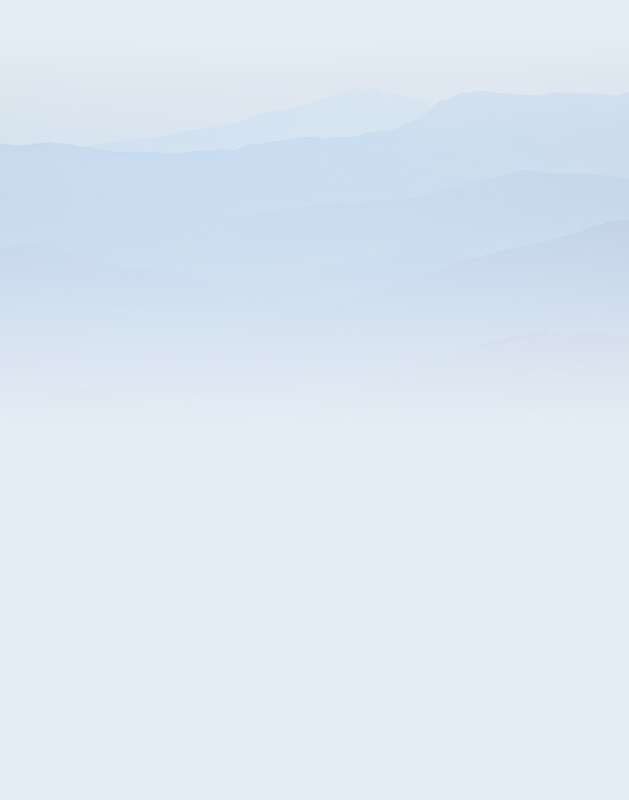 The easiest way to reach Cataloochee is from Interstate 40. Take the North Carolina exit #20 (Maggie Valley) and turn right into Cove Creek Road. The Foothills Parkway East Experience in Great Smoky Mountains National Park. This scenic drive over Green Mountain is lovely any time year; however in the fall, it provides some of the most vibrant displays of color we’ve ever seen in the Smokies! The road begins at the Foothills Parkway Exit #443 on Interstate 40, approximately 21 miles east of its interchange with Interstate 81. This section of the Foothills Parkway East is 6 miles long ending at the intersection with Highway 321 in Cosby, Tennessee. 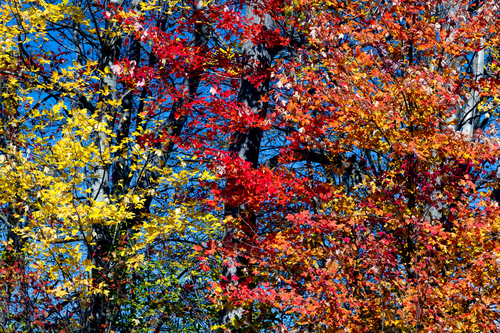 Along with your standard displays of red, orange and yellow, the foliage colors along the Foothills Parkway West are vibrant shades of fuchsia, peach, maroon, and neon yellow. The forest truly looks like a giant bowl of Kellogg’s Froot Loops cereal! Sounds outrageous we know, but it is unbelievably spectacular! It’s hard to say when it’s peak viewing time; however we usually start checking it out in early October so we don’t miss out. The First Pullout faces north with a splendid view of English Mountain. This high ridge which dominates the north rises 3,629 feet above sea level. Part of its imposing appearance is due to the lowland expanse separating the two. The valley below averages 1,300 feet above sea level. The difference in these two elevations is comparable to a 140 story skyscaper. To offer some perspective, consider the the Burj Khalifa in Dubai, the tallest building in the world, has 163 stories. The Second Pullout is after the drive crests and you begin to descend into the Cosby watershed. This amazing view to the south is sometimes referred to as the Heart of the Park. The high ridge stretching out to the left and right is the state line divide of Tennessee and North Carolina which is considered the “heart of the park.” The state line divide is also the path of the famous Appalachian Trail. The left most knob of the ridge is Mt. 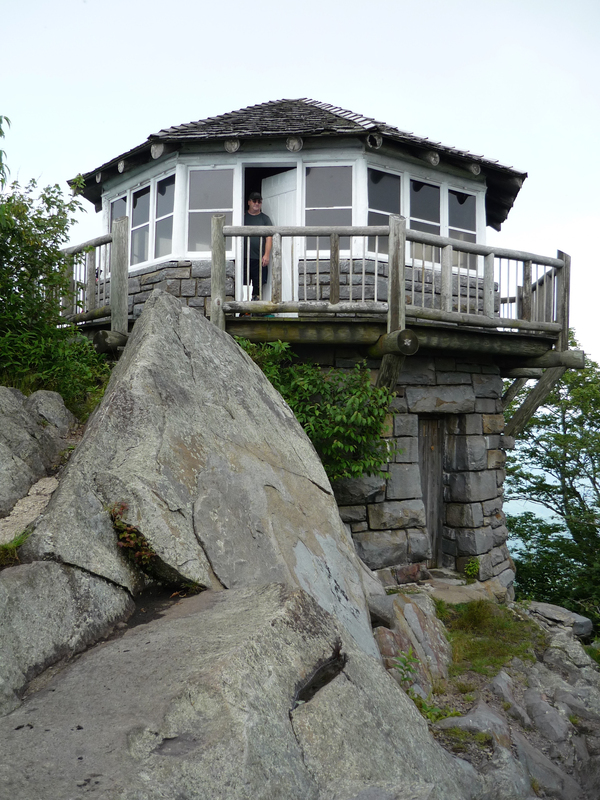 Cammerer with its historic fire tower (an awesome hike but that is another blog). Scanning to the right Low Gap is easy to pick out as seen rising above the Cosby Campground. Further right and the second highest peak in the park, Mt. Guyot, rises 6,621 feet above sea level. Far to the right you may even see the third highest peak in the park, the “Island in the Clouds,” Mt. LeConte rising 6,595 feet above sea level. The Third Pullout offers an excellent view to the west of the Cosby community with the spine of the Smoky Mountains working their way toward Cades Cove. It’s not unusual in this large parking area for families to gather in the evening with their lawn chairs and blankets to enjoy the sunset. The Foothills Parkway West dead ends at Highway 321 in Cosby, Tennessee. Taking a left here and traveling west is a 23-mile scenic drive to beautiful Gatlinburg, Tennessee. INSIDER TRAVEL TIPS: Since the Foothills Parkway East is a short jaunt, we want to suggest a few other fun and interesting things to do while you’re in the Cosby neck of the woods. Don’t miss a visit to visit Carvers Orchard and Applehouse Restaurant and take a short walk on the enchanting Cosby Nature Trail near Cosby Campground in the National Park. Stop by the the Sub Station Italian Restaurant and have a killer meatball sub…and tell Chef Frank his friends at HeySmokies say hello! For more info, check out our HeySmokies blog …feeling great in COSBY! 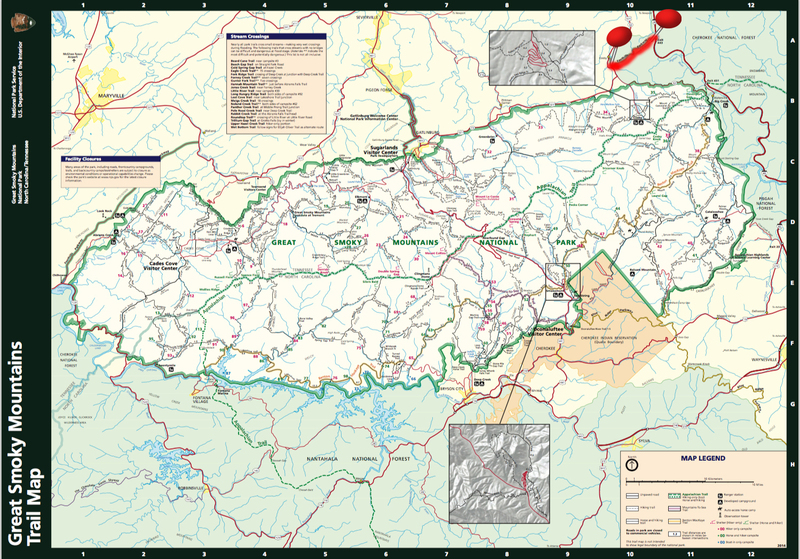 Foothills Parkway East is located, and noted in red, in the upper right quadrant of the GSMNP map. Big Creek ranger district is found on the eastern edge of Great Smoky Mountains National Park with a small campground for 12 sites for tents only. The popular and crystal clear swimming spot, Midnight Hole, is found here. This mountain watershed is one of the largest and most scenic in the park. Flanked by the towering Mt. Sterling to the south and Mt. 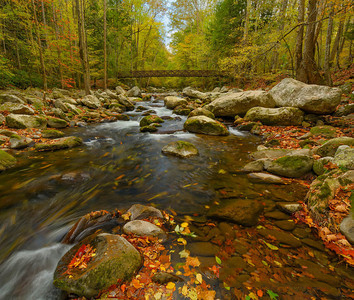 Cammerer to the north, Big Creek has an abundance of scenic beauty. Experience the grandeur of this clear mountain stream and surrounding forest any time of year for an experience you’ll never forget! Campground is open April 10 – October 31. With only 12 tent sites, Big Creek is the smallest campground in the park. RVs are not allowed. The campground is described as a walk-in campground because you park your car in a small parking lot and walk about 100-300 feet to your site. Some sites are on a small mound above, others are closer to the river. Each site has a tent pad, grill, a picnic table, and a pole for a lantern. A restroom, with flush toilets and cold water sinks, is located in the small parking area. You should bring everything you need with you since the closest grocery store is in Newport, Tennessee, about a 30-minute drive from Big Creek. Camp sites are first-come first-served. For more information visit www.nps.gov. 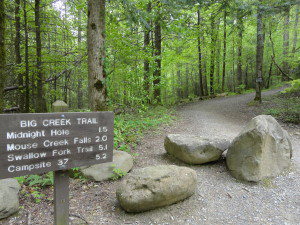 Big Creek Trail – Beginning above the picnic area follow an old railroad grade for just over 5 miles to Walnut Bottom Campsite #37. For an easy hike, take Big Creek Trail for 1.5 miles to Midnight Hole. The water flows between two huge boulders and into a large pool. This swimming hole is a favorite for kids of all ages. Another 0.5 mile takes you to Mouse Creek Falls, a 25-foot cascade located on the left as you go up. Look for a horse hitching rail as your signpost for the falls. Chestnut Branch Trail – Beginning at the Ranger Station near the entrance to Big Creek. This trail climbs out of the drainage area through a dense second growth forest 2 miles to the Appalachian Trail. Baxter Creek Trail – Take the steel foot bridge across Big Creek at the picnic area to begin this tough 6.2 mile climb to the summit of Mt. Sterling. 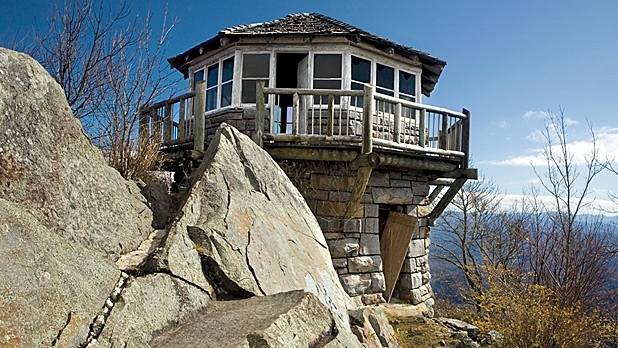 An amazing view awaits the brave few who climb the old fire tower at the end of the trail. Open April 10 – October 31. There are five campsites with potable water available. For more information visit www.nps.gov. A large picnic area, with its own parking lot, separates the tents-only campground from the horse camp. Running water and flush toilets can be found a half mile past the picnic area at the campground. Big Creek and the nearby Pigeon River are a favorite for anglers. Rainbow trout, small mouth bass and more can be found in these waters. Either a Tennessee www.tn.wildlifelicense.com or North Carolina www.ncwildlife.org fishing license is required in the park. If fishing outside the park stay aware of your location. This area straddles the state line and you definitely need the correct license for the state you are fishing in. White water rafting is a thriving business on the nearby Pigeon River. 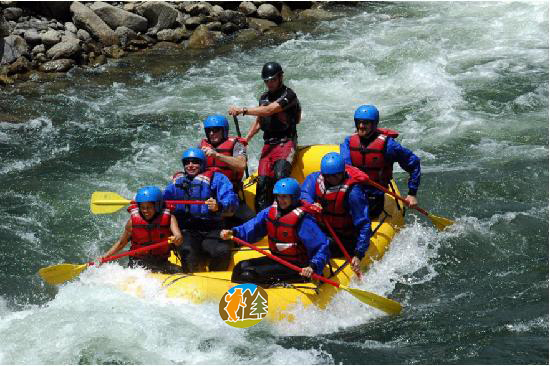 Enjoy a raging 5-mile white water experience or dial back the adrenaline on a scenic float trip. Most outfitters have an outpost in Hartford, Tennessee, five miles north of the Waterville Road exit on Interstate 40. Visit HeySmokiesRafting.com for rafting outfitters. Take Highway 321 East to Cosby, Tennessee. Turn left at the “T” and continue on to the Great Smoky Mountains Foothills Parkway. Turn right on the Parkway and proceed 7 miles to Interstate 40. Turn right on I-40 and head south toward Asheville, North Carolina. Drive 7 miles on I-40 and take the Waterville Road exit. Turn right on Waterville Road crossing the Pigeon River and drive 5 miles to the entrance of Big Creek. Take Interstate 40 North. After crossing the Tennessee state line take the Waterville Road exit. Turn left on Waterville Road crossing the Pigeon River and drive 5 miles to the Big Creek entrance. Big Creek is steeped in mountain history. This land was once home to the Cherokee Nation before the arrival of Europeans. For generations they farmed and hunted this land as their society thrived. European settlers occupied the land after the forced removal of the Cherokee on the Trail of Tears. The new inhabitants wasted little time building churches, ballfields, hunting lodges, homes and more. As the Anglo population soared in these pristine forests, the Smoky Mountains began to attract the attention of unscrupulous lumber barons from the Northeast. As Northern forests were depleted, a greedy nation quickly turned to logging this virgin timber. Railroads and mill towns sprang up almost overnight and during the next few decades millions of board feet of lumber were removed leaving the mountains nearly clear cut and ruining the ecosystem for many years. The creation of the National Park put an end to the lumber industry and the healing process began for the forest. As you wander through this amazing place try and imagine no trees for as far as you can see. It is hard to do when the view is limited to just a few feet because of all the trees; however, this would have been your experience if not for the realization of Great Smoky Mountains National Park.